An Army Materiel Command system of central and remote databases keeps track of combat gear stockpiled on three continents. Soldiers learn to use Intermec Technologies' handheld data collection device and scanner to capture records of equipment loaded onto transport ships. Using File Transfer Protocol exchanges on the Internet, Army personnel update their inventory four times daily via the Army War Reserve Deployment System (AWRDS). Sybase Inc.'s SQL Anywhere Studio 6.0 replicates the contents of 21 remote databases into one central repository at command headquarters. The stockpiles listed in AWRDS consist of military goods ranging from canned food to tanks, situated strategically for U.S. troops if they are deployed on short notice. Except for perishables such as rations and medicines, the reserve stockpiles remain in place unless troops go into combat, said Ron Hulscher, a contracting officer's representative at the Army Materiel Command in Alexandria, Va. The Army tracks the expiring perishables and the maintenance of items such as guns and vehicles. In 1992, the Army transferred ownership of its war reserve stockpiles from theater commanders to the Materiel Command, which manages and maintains the stockpiles electronically and transfers control of them electronically to troops during a conflict. To handle this mandate, the Materiel Command's Army War Reserve Supply Command in 1994 deployed the first version of AWRDS. Development, support, training and licensing cost $10 million to $15 million over the past six years, said Greg Denkler, vice president of Stanley Associates Inc. of Alexandria, Va., the command's systems integrator for the project. The system uses SQL Anywhere Studio's replication tool to distribute data between remote sites and headquarters, said Eric Murchie-Beyma, technical director at Stanley Associates. Headquarters staff can see all information in the central database; remote users see only their own data. The central database holds about 2G of data on 1.2 million stockpiled items, Murchie-Beyma said. The remote data sets average a few hundred megabytes each. Stanley Associates chose SQL Anywhere Studio over a larger enterprise database management system because it can handle disconnected data replication, Murchie-Beyma said. Other DBMS products that were on the market during AWRDS' development required a constant WAN connection between remote and central sites, he said. Continuous links, however, were not an option for some stockpile sites in 1994, Denkler said. Rather than build a network infrastructure, the command chose to link AWRDS databases via FTP over T1 and Integrated Services Digital Network lines, Murchie-Beyma said. Most of the AWRDS servers have dual Pentium Pro processors and run Microsoft Windows NT, Denkler said. The command has stockpiles in Belgium, Great Britain, Italy, Japan, Luxembourg, the Netherlands, Norway, the Persian Gulf countries of Qatar and Kuwait, and South Korea. Within the United States, Army supplies are stored at facilities in Chambersburg, Pa., Richmond, Va., and Rock Island, Ill.
For the most part, soldiers still use clipboards and paper to count items and then type the information into the remote databases. 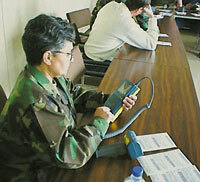 Some soldiers use Janus handheld computers and bar code scanners from Intermec Technologies Corp. of Everett, Wash., to track equipment shipping. SQL Anywhere Studio 7.0, released in February, will let AWRDS integrators transform the client-server application into a three-tier system that can receive input from handheld devices running Palm OS from Palm Computing Inc. of Santa Clara, Calif.
AWRDS programmers have been using a beta of Version 7.0 to develop the next AWRDS release, which will come out by the year's end, Murchie-Beyma said. To eliminate paperwork and speed data entry, the developers will use Palm OS devices from Symbol Technologies Inc. of Holtsville, N.Y., that have integrated bar code scanners and wireless LAN connections. The command periodically publishes a read-only CD-ROM of AWRDS data, Hulscher said. Called the Automated Battlebook System, the CD gives all Army units a snapshot of combat stockpiles available worldwide. AWRDS uses the backup capabilities embedded in SQL Anywhere Studio, Murchie-Beyma said. Remote servers back themselves up whenever they ftp a data file to headquarters. Systems administrators also make a daily backup tape of the whole system. The FTP addresses are available only to the replicating servers, and data files are encrypted before transmission, Murchie-Beyma said. None of the AWRDS data is classified, Denkler said.